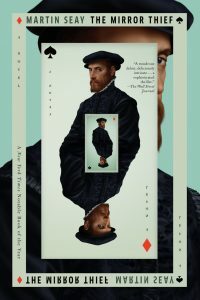 In its first-annual Chirby awards, the Chicago Review of Books has named THE MIRROR THIEF the best debut of 2016 from a list of distinguished finalists that also included THE HOUSEGUEST by Kim Brooks, AND AGAIN by Jessica Chiarella, HEARTBREAKER by Maryse Meijer, TOO LIKE THE LIGHTNING by Ada Palmer, and TACKY GOBLIN by T. Sean Steele. Other Chirby winners included Abby Geni for THE LIGHTKEEPERS (best fiction), Natalie Y. Moore for THE SOUTH SIDE (best nonfiction), and Abigail Zimmer for CHILD IN A WINTER HOUSE BRIGHTENING (best poetry). 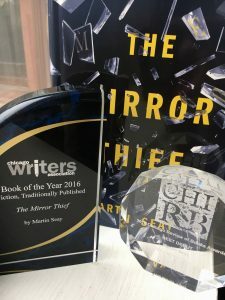 The Chirby is the second regional literary award won by THE MIRROR THIEF, following the Chicago Writers Association 2016 Book of the Year Award for traditionally-published fiction. Martin’s essay “New Strategies for Invisibility” was also recently reprinted in MAKE X, the tenth-anniversary anthology of selections from MAKE literary magazine; the essay originally appeared in the spring/summer 2010 issue. Publishers Weekly has included THE MIRROR THIEF in its list of the best fiction of 2016. Prior to the book’s publication, PW provided a starred and boxed review, and also featured Martin in its spring list of writers to watch. Additionally, the New York Times Book Review has named THE MIRROR THIEF one of 100 notable books of 2016. Novelist Scarlett Thomas‘s review of the novel appeared in the May 27, 2016 edition of the NYTBR. The Chicago Writers Association has picked THE MIRROR THIEF as the 2016 Book of the Year in the category of traditionally-published fiction. The other finalists in the category were SWARM THEORY by Christine Rice and THE FUGUE by Gint Aras. 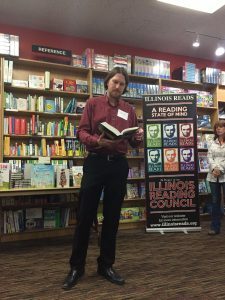 The CWA will hold its annual award ceremony on Saturday, January 14 at the Book Cellar in Lincoln Square to honor the winners in all categories, and to bestow its annual Spirit Award on author Donald G. Evans, founder of the Chicago Literary Hall of Fame. The event begins at 7 p.m. and is open to the public. THE MIRROR THIEF is also a finalist for the 2016 Debut Award from the Chicago Review of Books; winners will be announced on Thursday, December 8. Director Peter Chelsom and his collaborators Tinker Lindsay and John Albanis have acquired the rights to adapt THE MIRROR THIEF as a film. After a distinguished career as an actor, Chelsom established himself as a director with a number of acclaimed and successful feature films, including Funny Bones, Serendipity, the English-language remake of Shall We Dance?, and the forthcoming The Space between Us. Screenwriter Lindsay is also the coauthor of the Tenzing Norbu series of mystery novels; producer Albanis is himself an accomplished filmmaker. The team has previously collaborated on several projects, including the 2014 film Hector and the Search for Happiness. The Center for Fiction has included THE MIRROR THIEF on its Long List for the 2016 First Novel Prize, along with 24 other outstanding debuts. The Short List will be announced in September; the winner will be declared at the Center’s Annual Benefit and Awards Dinner on December 6. The only nonprofit organization in the United States exclusively dedicated to celebrating and supporting fiction, the Center provides both readers and writers with a number of opportunities and resources. After receiving advance buzz from the American Booksellers Association, Open Letters Monthly, the Chicago Tribune, Curbside Splendor, Nerdist, Publishers Weekly, and elsewhere, Martin Seay’s debut novel was published by Melville House on May 10, 2016. Martin wrote a short essay for Melville House about writing THE MIRROR THIEF. An excerpt from the book is also available through their site.